In meteorology, precipitation (also known as one of the classes of hydrometeors, which are atmospheric water phenomena) is any product of the condensation of atmospheric water vapor that is pulled down by gravity and deposited on the Earth's surface. The main forms of precipitation include rain, snow, ice pellets, and graupel. It occurs when the atmosphere, a large gaseous solution, becomes saturated with water vapour and the water condenses, falling out of solution (i.e., precipitates). Two processes, possibly acting together, can lead to air becoming saturated: cooling the air or adding water vapour to the air. Virga is precipitation that begins falling to the earth but evaporates before reaching the surface; it is one of the ways air can become saturated. Precipitation forms via collision with other rain drops or ice crystals within a cloud. Rain drops range in size from oblate, pancake-like shapes for larger drops, to small spheres for smaller drops. Precipitation that reaches the surface of the earth can occur in many different forms, including rain, freezing rain, drizzle, ice needles, snow, ice pellets or sleet, graupel and hail. Hail is formed within cumulonimbus clouds when strong updrafts of air cause the stones to cycle back and forth through the cloud, causing the hailstone to form in layers until it becomes heavy enough to fall from the cloud. Unlike raindrops, snowflakes grow in a variety of different shapes and patterns, determined by the temperature and humidity characteristics of the air the snowflake moves through on its way to the ground. While snow and ice pellets require temperatures close to the ground to be near or below freezing, hail can occur during much warmer temperature regimes due to the process of its formation. Precipitation may occur on other celestial bodies, e.g. when it gets cold, Mars has precipitation which most likely takes the form of ice needles, rather than rain or snow. The urban heat island effect leads to increased rainfall, both in amounts and intensity, downwind of cities. Global warming is also causing changes in the precipitation pattern globally, including wetter conditions across eastern North America and drier conditions in the tropics. Precipitation is a major component of the water cycle, and is responsible for depositing most of the fresh water on the planet. Approximately of water falls as precipitation each year; of it over the oceans. Given the Earth's surface area, that means the globally-averaged annual precipitation is . Climate classification systems such as the Köppen climate classification system use average annual rainfall to help differentiate between differing climate regimes. This anvil-shaped Cumulonimbus incus cloud is composed of hydrometeors. The term meteor describes an object from outer space which has entered the Earth's atmosphere and produces a light phenomenon. 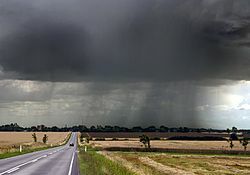 In contrast, any phenomenon which was at some point produced due to condensation or precipitation of moisture within the Earth's atmosphere is known as a hydrometeor. Particles composed of fallen precipitation which fell onto the Earth's surface can become hydrometeors if blown off the landscape by wind. Formations due to condensation such as clouds, haze, fog, and mist are composed of hydrometeors. All precipitation types are hydrometeors by definition, including virga, which is precipitation which evaporates before reaching the ground. Particles removed from the Earth's surface by wind such as blowing snow and blowing sea spray are also hydrometeors. Precipitation is a major component of the water cycle, and is responsible for depositing most of the fresh water on the planet. Approximately 505,000 km3 (121,000 cu mi) of water falls as precipitation each year, 398,000 km3 (95,000 cu mi) of it over the oceans. Given the Earth's surface area, that means the globally-averaged annual precipitation is . Air contains water vapour, measured in grams of water per kilogram of dry air (g/kg), but most commonly reported as a relative humidity. How much water vapour a parcel of air can contain before it becomes saturated (100% relative humidity) depends on its temperature. Warmer air can contain more water vapour than cooler air before becoming saturated. Therefore, one way to saturate a parcel of air is to cool it. The dew point is the temperature to which a parcel must be cooled in order to become saturated. Water vapour normally begins to condense on condensation nuclei such as dust, ice, and salt in order to form clouds. An elevated portion of a frontal zone forces broad areas of lift, which form clouds decks such as altostratus or cirrostratus. Stratus is a stable cloud deck which tends to form when a cool, stable air mass is trapped underneath a warm air mass. It can also form due to the lifting of advection fog during breezy conditions. Coalescence occurs when water droplets fuse to create larger water droplets, or when water droplets freeze onto an ice crystal, which is known as the Bergeron process. Air resistance typically causes the water droplets in a cloud to remain stationary. When air turbulence occurs, water droplets collide, producing larger droplets. As these larger water droplets descend, coalescence continues, so that drops become heavy enough to overcome air resistance and fall as rain. Coalescence generally happens most often in clouds above freezing. In clouds below freezing, when ice crystals gain enough mass they begin to fall. This generally requires more mass than coalescence when occurring between the crystal and neighboring water droplets. This process is temperature dependent, as supercooled water droplets only exist in a cloud that is below freezing. In addition, because of the great temperature difference between cloud and ground level, these ice crystals may melt as they fall and become rain. Raindrops have sizes ranging from to mean diameter, above which they tend to break up. Smaller drops are called cloud droplets, and their shape is spherical. As a raindrop increases in size, its shape becomes more oblate, with its largest cross-section facing the oncoming airflow. Contrary to the cartoon pictures of raindrops, their shape does not resemble a teardrop. Intensity and duration of rainfall are usually inversely related, i.e., high intensity storms are likely to be of short duration and low intensity storms can have a long duration. Rain drops associated with melting hail tend to be larger than other rain drops. The METAR code for rain is RA, while the coding for rain showers is SHRA. Ice pellets are a form of precipitation consisting of small, translucent balls of ice. This form of precipitation is also known as sleet in the United States . Ice pellets are usually (but not always) smaller than hailstones. They often bounce when they hit the ground, and generally do not freeze into a solid mass unless mixed with freezing rain. The METAR code for ice pellets is PL. Ice pellets form when a layer of above-freezing air is located between and above the ground, with sub-freezing air both above and below it. This causes the partial or complete melting of any snowflakes falling through the warm layer. As they fall back into the sub-freezing layer closer to the surface, they re-freeze into ice pellets. However, if the sub-freezing layer beneath the warm layer is too small, the precipitation will not have time to re-freeze, and freezing rain will be the result at the surface. A temperature profile showing a warm layer above the ground is most likely to be found in advance of a warm front during the cold season , but can occasionally be found behind a passing cold front. Like other precipitation, hail forms in storm clouds when supercooled water droplets freeze on contact with condensation nuclei, such as dust or dirt. The storm's updraft blows the hailstones to the upper part of the cloud. The updraft dissipates and the hailstones fall down, back into the updraft, and are lifted up again. Hail has a diameter of or more. Within METAR code, GR is used to indicate larger hail, of a diameter of at least . GR is derived from the French word grêle. Smaller-sized hail, as well as snow pellets, use the coding of GS, which is short for the French word grésil. Stones just larger than golf ball-sized are one of the most frequently reported hail sizes. Hailstones can grow to and weigh more than . In large hailstones, latent heat released by further freezing may melt the outer shell of the hailstone. The hailstone then may undergo 'wet growth', where the liquid outer shell collects other smaller hailstones. The hailstone gains an ice layer and grows increasingly larger with each ascent. Once a hailstone becomes too heavy to be supported by the storm's updraft, it falls from the cloud. Hail forms in strong thunderstorm clouds, particularly those with intense updrafts, high liquid water content, great vertical extent, large water droplets, and where a good portion of the cloud layer is below freezing . Hail-producing clouds are often identifiable by their green coloration. The growth rate is maximized at about , and becomes vanishingly small much below as supercooled water droplets become rare. For this reason, hail is most common within continental interiors of the mid-latitudes, as hail formation is considerably more likely when the freezing level is below the altitude of . Entrainment of dry air into strong thunderstorms over continents can increase the frequency of hail by promoting evaporational cooling which lowers the freezing level of thunderstorm clouds giving hail a larger volume to grow in. Accordingly, hail is actually less common in the tropics despite a much higher frequency of thunderstorms than in the mid-latitudes because the atmosphere over the tropics tends to be warmer over a much greater depth. Hail in the tropics occurs mainly at higher elevations. Snow crystals form when tiny supercooled cloud droplets (about 10 μm in diameter) freeze. These droplets are able to remain liquid at temperatures lower than , because to freeze, a few molecules in the droplet need to get together by chance to form an arrangement similar to that in an ice lattice; then the droplet freezes around this "nucleus." Experiments show that this "homogeneous" nucleation of cloud droplets only occurs at temperatures lower than . In warmer clouds an aerosol particle or "ice nucleus" must be present in (or in contact with) the droplet to act as a nucleus. Our understanding of what particles make efficient ice nuclei is poor — what we do know is they are very rare compared to that cloud condensation nuclei on which liquid droplets form. Clays, desert dust and biological particles may be effective, although to what extent is unclear. Artificial nuclei include particles of silver iodide and dry ice, and these are used to stimulate precipitation in cloud seeding. Once a droplet has frozen, it grows in the supersaturated environment, which is one where air is saturated with respect to ice when the temperature is below the freezing point. The droplet then grows by diffusion of water molecules in the air (vapor) onto the ice crystal surface where they are collected. Because water droplets are so much more numerous than the ice crystals due to their sheer abundance, the crystals are able to grow to hundreds of micrometers or millimeters in size at the expense of the water droplets. This process is known as the Wegner-Bergeron-Findeison process. The corresponding depletion of water vapor causes the droplets to evaporate, meaning that the ice crystals grow at the droplets' expense. These large crystals are an efficient source of precipitation, since they fall through the atmosphere due to their mass, and may collide and stick together in clusters, or aggregates. These aggregates are snowflakes, and are usually the type of ice particle that falls to the ground. Guinness World Records list the world’s largest snowflakes as those of January 1887 at Fort Keogh, Montana; allegedly one measured 38 cm (15 inches) wide. The exact details of the sticking mechanism remain controversial. Possibilities include mechanical interlocking, sintering, electrostatic attraction as well as the existence of a "sticky" liquid-like layer on the crystal surface. The individual ice crystals often have hexagonal symmetry. Although the ice is clear, scattering of light by the crystal facets and hollows/imperfections mean that the crystals often appear white in color due to diffuse reflection of the whole spectrum of light by the small ice particles. The shape of the snowflake is determined broadly by the temperature and humidity at which it is formed. Rarely, at a temperature of around , snowflakes can form in threefold symmetry — triangular snowflakes. The most common snow particles are visibly irregular, although near-perfect snowflakes may be more common in pictures because they are more visually appealing. No two snowflakes are alike due to the 10,000,000,000,000,000,000 water molecules which make up a snowflake, which grow at different rates and in different patterns depending on the changing temperature and humidity within the atmosphere that the snowflake falls through on its way to the ground. The METAR code for snow is SN, while snow showers are coded SHSN. In Hawaii , Mount Waiʻaleʻale , on the island of Kauai, is notable for its extreme rainfall, as it has the second highest average annual rainfall on Earth, with . Storm systems affect the state with heavy rains between October and March. Local climates vary considerably on each island due to their topography, divisible into windward (Ko olau) and leeward (Kona) regions based upon location relative to the higher mountains. Windward sides face the east to northeast trade winds and receive much more rainfall; leeward sides are drier and sunnier, with less rain and less cloud cover. Extratropical cyclones can bring cold and dangerous conditions with heavy rain and snow with winds exceeding 119 km/h (74 mph), (sometimes referred to as windstorms in Europe). The band of precipitation that is associated with their warm front is often extensive, forced by weak upward vertical motion of air over the frontal boundary which condenses as it cools and produces precipitation within an elongated band, which is wide and stratiform, meaning falling out of nimbostratus clouds. When moist air tries to dislodge an arctic air mass, overrunning snow can result within the poleward side of the elongated precipitation band. In the Northern Hemisphere , poleward is towards the North Pole , or north. Within the Southern Hemisphere , poleward is towards the South Pole , or south. Within the cold sector, poleward and west of the cyclone center, small scale or mesoscale bands of heavy snow can occur within a cyclone's comma-head pattern. This pattern is a comma-shaped area of clouds and precipitation found around mature extratropical cyclones. These snow bands typically have a width of to . The bands in the comma head are associated with areas of frontogenesis, or zones of strengthening temperature contrast. The wet, or rainy, season is the time of year, covering one or more months, when most of the average annual rainfall in a region falls. The term green season is also sometimes used as a euphemism by tourist authorities. Areas with wet seasons are dispersed across portions of the tropics and subtropics. Savanna climates and areas with monsoon regimes have wet summers and dry winters. Tropical rainforests technically do not have dry or wet seasons, since their rainfall is equally distributed through the year. Some areas with pronounced rainy seasons will see a break in rainfall mid-season when the intertropical convergence zone or monsoon trough move poleward of their location during the middle of the warm season. When the wet season occurs during the warm season, or summer, rain falls mainly during the late afternoon and early evening hours. The wet season is a time when air quality improves, freshwater quality improves, and vegetation grows significantly. Soil nutrients diminish and erosion increases. Animals have adaptation and survival strategies for the wetter regime. Unfortunately, the previous dry season leads to food shortages into the wet season, as the crops have yet to mature. Developing countries have noted that their populations show seasonal weight fluctuations due to food shortages seen before the first harvest, which occurs late in the wet season. The standard way of measuring rainfall or snowfall is the standard rain gauge, which can be found in 100-mm (4-in) plastic and 200-mm (8-in) metal varieties. The inner cylinder is filled by 25 mm (1 in) of rain, with overflow flowing into the outer cylinder. Plastic gages have markings on the inner cylinder down to 0.25 mm (0.01 in) resolution, while metal gages require use of a stick designed with the appropriate 0.25 mm (0.01 in) markings. After the inner cylinder is filled, the amount inside it is discarded, then filled with the remaining rainfall in the outer cylinder until all the fluid in the outer cylinder is gone, adding to the overall total until the outer cylinder is empty. These gages are winterized by removing the funnel and inner cylinder and allowing snow and freezing rain to collect inside the outer cylinder. Some add anti-freeze to their gage so they do not have to melt the snow or ice that falls into the gage. Once the snowfall/ice is finished accumulating, or as you approach 300 mm (12 in), one can either bring it inside to melt, or use luke warm water to fill the inner cylinder with in order to melt the frozen precipitation in the outer cylinder, keeping track of the warm fluid added, which is subsequently subtracted from the overall total once all the ice/snow is melted. Other types of gages include the popular wedge gage (the cheapest rain gage and most fragile), the tipping bucket rain gage, and the weighing rain gage. The wedge and tipping bucket gages will have problems with snow. Attempts to compensate for snow/ice by warming the tipping bucket meet with limited success, since snow may sublimate if the gage is kept much above freezing. Weighing gages with antifreeze should do fine with snow, but again, the funnel needs to be removed before the event begins. For those looking to measure rainfall the most inexpensively, a can that is cylindrical with straight sides will act as a rain gage if left out in the open, but its accuracy will depend on what ruler you use to measure the rain with. Any of the above rain gages can be made at home, with enough know-how. The likelihood or probability of an event with a specified intensity and duration, is called the return period or frequency. The intensity of a storm can be predicted for any return period and storm duration, from charts based on historic data for the location. The term 1 in 10 year storm describes a rainfall event which is rare and is only likely to occur once every 10 years, so it has a 10 percent likelihood any given year. The rainfall will be greater and the flooding will be worse than the worst storm expected in any single year. The term 1 in 100 year storm describes a rainfall event which is extremely rare and which will occur with a likelihood of only once in a century, so has a 1 percent likelihood in any given year. The rainfall will be extreme and flooding to be worse than a 1 in 10 year event. As with all probability events, it is possible to have multiple "1 in 100 Year Storms" in a single year. Rain forests are characterized by high rainfall, with definitions setting minimum normal annual rainfall between and . A tropical savanna is a grassland biome located in semi-arid to semi-humid climate regions of subtropical and tropical latitudes, with rainfall between and a year. They are widespread on Africa, and are also found in India , the northern parts of South America, Malaysia , and Australia. The humid subtropical climate zone where winter rainfall (and sometimes snowfall) is associated with large storms that the westerlies steer from west to east. Most summer rainfall occurs during thunderstorms and from occasional tropical cyclones. Humid subtropical climates lie on the east side continents, roughly between latitudes 20° and 40° degrees away from the equator. An oceanic (or maritime) climate is typically found along the west coasts at the middle latitudes of all the world's continents, bordering cool oceans, as well as southeastern Australia, and is accompanied by plentiful precipitation year round. The Mediterranean climate regime resembles the climate of the lands in the Mediterranean Basin, parts of western North America, parts of Western and South Australia , in southwestern South Africa and in parts of central Chile . The climate is characterized by hot, dry summers and cool, wet winters. A steppe is a dry grassland. Subarctic climates are cold with continuous permafrost and little precipitation. Increasing temperatures tend to increase evaporation which leads to more precipitation. As average global temperatures have risen, average global precipitation has also increased. Precipitation generally increased over land north of 30°N from 1900 through 2005 but has declined over the tropics since the 1970s. Globally there has been no statistically significant overall trend in precipitation over the past century, although trends have varied widely by region and over time. Eastern portions of North and South America, northern Europe, and northern and central Asia have become wetter. The Sahel, the Mediterranean, southern Africa and parts of southern Asia have become drier. There has been an increase in the number of heavy precipitation events over many areas during the past century, as well as an increase since the 1970s in the prevalence of droughts—especially in the tropics and subtropics. Changes in precipitation and evaporation over the oceans are suggested by the decreased salinity of mid- and high-latitude waters (implying more precipitation), along with increased salinity in lower latitudes (implying less precipitation and/or more evaporation). Over the contiguous United States, total annual precipitation increased at an average rate of 6.1 percent per century since 1900, with the greatest increases within the East North Central climate region (11.6 percent per century) and the South (11.1 percent). Hawaii was the only region to show a decrease (-9.25 percent). The urban heat island warms cities 0.6 °C (1.1 °F) to 5.6 °C (10.1 °F) above surrounding suburbs and rural areas. This extra heat leads to greater upward motion, which can induce additional shower and thunderstorm activity. Rainfall rates downwind of cities are increased between 48% and 116%. Partly as a result of this warming, monthly rainfall is about 28% greater between to downwind of cities, compared with upwind. Some cities induce a total precipitation increase of 51%. The Quantitative Precipitation Forecast (abbreviated QPF) is the expected amount of liquid precipitation accumulated over a specified time period over a specified area. A QPF will be specified when a measurable precipitation type reaching a minimum threshold is forecast for any hour during a QPF valid period. Precipitation forecasts tend to be bound by synoptic hours such as 0000, 0600, 1200 and 1800 GMT. Terrain is considered in QPFs by use of topography or based upon climatological precipitation patterns from observations with fine detail. Starting in the mid to late 1990s, QPFs were used within hydrologic forecast models to simulate impact to rivers throughout the United States. Forecast models show significant sensitivity to humidity levels within the planetary boundary layer, or in the lowest levels of the atmosphere, which decreases with height. QPF can be generated on a quantitative, forecasting amounts, or a qualitative, forecasting the probability of a specific amount, basis. Radar imagery forecasting techniques show higher skill than model forecasts within 6 to 7 hours of the time of the radar image. The forecasts can be verified through use of rain gage measurements, weather radar estimates, or a combination of both. Various skill scores can be determined to measure the value of the rainfall forecast.